Be the first to share your favorite memory, photo or story of Natalena. This memorial page is dedicated for family, friends and future generations to celebrate the life of their loved one. 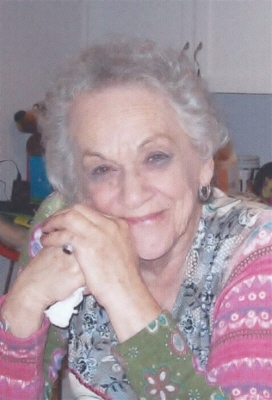 BEVERLY- Natalena T. Modugno, age 88 died Monday September 3, 2018. Born and raised in Beverly she was the daughter of the late Ottaviano and Costanza (D’Alessandro) Modugno. She graduated from Beverly High School and the New England Conservatory. She auditioned and was accepted to the Metropolitan Opera House in New York City. She was a fashion model and later owned and operated two clothing boutiques. She enjoyed spending time with her family and friends, especially her grandson and best friend Todd. She loved all animals, but had a special place in her heart for Otto, Andy, and Adia, the family dogs. She had fun going to the casino with her daughter and friends. She valued hard work and generosity, and was blessed with an infectious laugh. She kept her love of music, singing at weddings and in churches as well as making up songs for her grandchildren. Surviving her is a daughter Constance Simon and her husband George of Beverly; three grandchildren Todd Simon, Erin Simon, Wendi Smith and her husband Benjamin Wilcox; 1 great grandchild, Carter Smith; two step great grandchildren, Sophia and Jackson Wilcox; two nieces, Emily Comiskey and Susan Burch; two nephews, David Modugno and George Comiskey. She was predeceased by a sister Mary Comiskey; a brother Sabino Modugno and a nephew John Modugno. Her funeral service will be held at the Campbell Funeral Home, 525 Cabot Street, Beverly , Friday, September 7, 2018 at 12 p.m. Relatives and friends are invited to attend. Visiting hours will be held prior from 11 a.m. to 12 p.m. In lieu of flowers contributions may be made in her memory to Sweet Paws Rescue, PO Box 752, Essex MA 01929. Information, directions, condolences at www.campbellfuneral.com . To send flowers or a remembrance gift to the family of Natalena Theresa Modugno, please visit our Tribute Store. "Email Address" would like to share the life celebration of Natalena Theresa Modugno. Click on the "link" to go to share a favorite memory or leave a condolence message for the family.